Integral simplex using decomposition (ISUD) is a method that efficiently solves set partitioning problems. It is an iterative method that starts from a known integer solution and moves through a sequence of integer solutions, decreasing the cost at each iteration. At each iteration, the method decomposes the original problem into a reduced problem (RP) and a complementary problem (CP). Given an integer solution to RP (that is also solution to the original problem), CP finds a descent direction having the minimum ratio between its cost and the number of its positive variables. We loop on until an optimal or near-optimal solution to the original problem is reached. 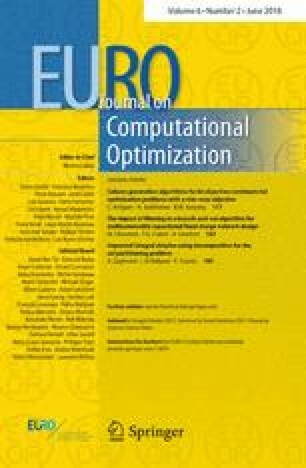 In this paper, we introduce a modified model for CP. The new model finds a descent direction that minimizes the ratio between the cost of the direction and an overestimation of the number of variables taking one in the next solution. The new CP presents higher chances of finding improved integer solutions without branching. We present results for the same large instances (with up to 570,000 columns) as the ones previously used to test ISUD. For all the instances, optimality is always reached with a speedup factor of at least five.